Aspergillus brasiliensis (brown) and Aspergillus versicolor (yellow) colonizing on a plastic substrate. For those familiar with MIL-STD-810 you will see a new name in Change 1 Fungus Method 508.7. Aspergillus brasiliensis, designated by the American Type Culture Collection (ATCC) as the strain number 9642, is a fungus that has been commonly used as an agent in the MIL-STD-810 and several other environmental fungus tests. This strain was originally isolated in Sydney (New South Wales), Australia from wireless radio equipment by R.E. Klausmeier (U.S. Ammunition Depot, Crane, Indiana) in 1944. It was described based on morphological and sexual features, and originally named Aspergillus niger. 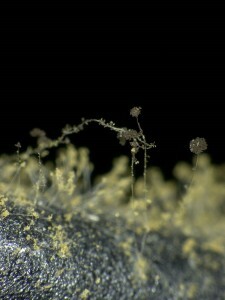 However, applied advanced molecular techniques have shown differences between Aspergillus niger type specimen and the ATCC 9642 strain. As a result the ATCC 9642 strain was recently reclassified and renamed as Aspergillus brasiliensis. facility, our team provides a variety of fungus and fungus resistance testing. Check it out and request a quote today!